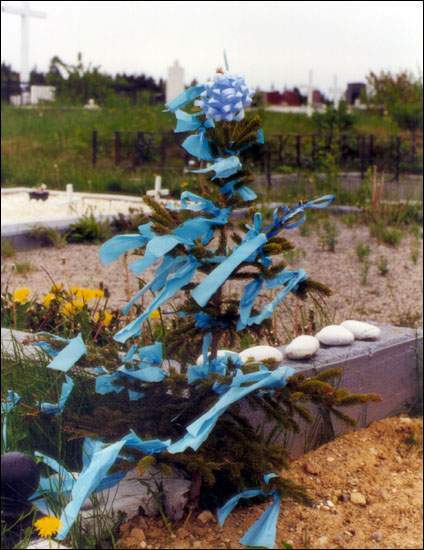 In some areas of Newfoundland, particularly those with an Irish and agricultural heritage, spruce or fir saplings stripped of most of their limbs, save a few near the top, bedecked with strips of coloured cloth or ribbons, appear on the first day of May. 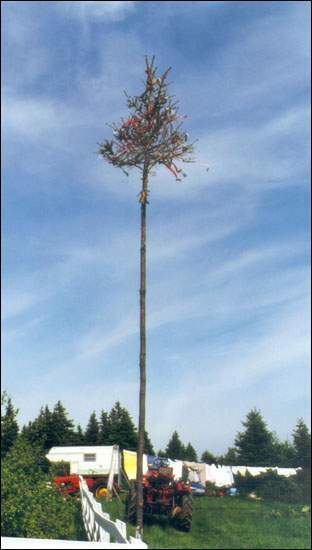 These may bushes (also called maypoles, may brushes or may trees) are often nailed to fences or gates and are kept there by the householders who erected them for the duration of the month. Historically, may bushes have had festive, protective, decorative, invocational, or religious functions. While many festivities associated with May or the arrival of spring can be traced back to ancient Rome, Egypt or India, the specific inclusion of the maypole in springtime rituals and celebrations is usually associated with the ancient Celts. It was an emblem of ancient fertility used during Bealtine (or Beltane), a pagan agrarian festival observed on May Day (May 1st) to mark the beginning of summer. A blasty (dried out) may bush late in the month. Reproduced by permission of Lara Maynard. Photo ©1999. In medieval England the maypole was a chief feature of May Day celebrations. Customarily, young people would cut down a tree on May Day morning and cut off most of its branches. It was decorated with flowers and streamers, paraded about, and then served as an axis for a maypole dance during which participants holding the ends of streamers circled the pole. In some parishes these poles would be reused and redecorated for a number of years. In Ireland may bushes (often whitethorn bushes) or may boughs (sometimes from a sycamore) were decorated with flowers, which were thought to ward off evil and bring good luck. Is some areas may bushes became maypoles. Eventually may bushes in Ireland became associated with honouring the Blessed Virgin Mary. May bushes were decorated with candles and dances were held in Her honour. Children might also pick May flowers in Mary's honour and use them to decorate small shrines or altars. Springtime has long been associated with feminine deities. In Greek culture it was dedicated to Artemis, goddess of fecundity. In Roman culture it was dedicated to Flora, the goddess of blossoms. In the 18th century the Christian Church adopted May as a month for the devotion of Mary and two Marian liturgical celebrations, the Feast of Our Lady, Queen of the Apostles and the Commemoration of the Visitation, are observed during the month. The month of May is now dedicated to Mary in many Christian cultures and it is often referred to as "Mary month" in popular devotion. Newfoundlanders who erect may bushes nowadays usually cite the commemoration of "Mary's month" as the reason for doing so. Indeed, their may bushes are often predominantly or solely decorated in blue ribbons, blue being the colour often associated with Mary in iconography. Some people add red ribbons to their bushes in June in commemoration of the Sacred Heart of Jesus and do not take them down until the end of that month. May bush, Flatrock's cemetery, 1999. The family of the man on whose grave the bush sits has placed one there every year since his death in remembrance of his regular practise of the custom. While the custom of erecting may bushes now seems to be motivated by a combination of religion and tradition, it is worth noting that instances of them being erected for good luck, whether in general or for fruitful planting, have been recorded at least as late as the 1970s. For other related articles view the Customs section of the Society and Culture Table of Contents.